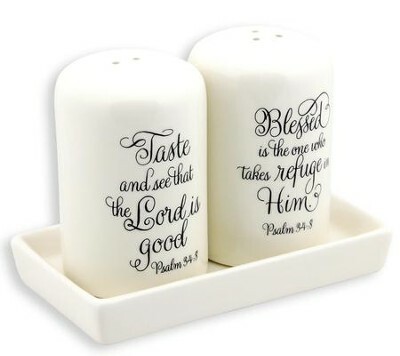 White ceramic salt and pepper set with tray, right at home in your kitchen or on your dining table. Scripture verse quotes in uspcale font design. Shakers are 3" x 1.75"; matching ceramic tray is 4.75" x 2.75". I'm the author/artist and I want to review Taste And See, Salt And Pepper Shaker Set.